Mountain biking is a thrilling activity that pushes your body to the limit. Hours are spent exploring the off-road terrain and experiencing nature at its finest. With so much time spent away from the safety of home, it’s important to have the right tools and accessories at your disposal. One of the most beneficial pieces of gear a mountain biking enthusiast can invest in is a durable backpack with a hydration bladder. Whether you’re on an intense trail full of twists, turns, and obstacles or simply taking a leisurely ride through the scenic route, staying hydrated is key. Not only will drinking lots of water keep you cool, but it will allow your body to go further than ever. Mountain backpacks with hydration bladders keep everything you’ll need in one convenient package. Instead of lugging around bottles of water, the large bladder is filled up and slipped into a specially designed pocket in the backpack. It’s then attached to a hose that provides water quick and conveniently. There are no pesky caps to worry about and bikers can become rehydrated while keeping their hands on the bike. Another great thing about these backpacks is the ability to store the essentials. In addition to water, a mountain biking backpack has enough room to comfortably store safety and emergency gear, ensuring that your ride goes smoothly. While numerous different options are out there for the taking, here are some of the best mountain biking backpacks with a hydration bladder. 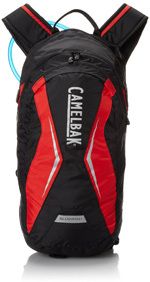 This backpack from CamelBak boasts a small footprint and adequate storage. It has a skinny profile that fits unobtrusively on the back. Inside, the backpack holds a 2-liter bladder. 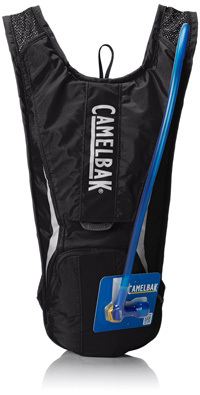 Unlike other models that require you to remove the bladder to fill it, this pack has a quick release flap for refills. On the exterior of the backpack is a zippered pocket that can hold small essentials. 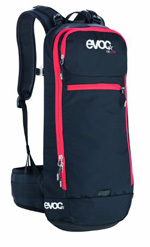 It comes in a variety of bright colors and has adjustable shoulder straps that are 34 inches long when fully extended. If more storage is what you’re after, the Osprey Packs Rev incorporates versatile storage options throughout. Not only does it have a large main pocket, but it also has mesh harnesses that can hold loose objects. The shoulder strap has a media pocket that easily flips down once the security buckle is released. The included bladder can hold up to 1.5 liters and has a quick fill valve located inside the main pocket. The straps of the backpack have a harness that moves with your body for maximum comfort. It also has a mesh back for increased air circulation. The Hydro Lite 3.0 backpack includes a large bladder with a 3-liter capacity. The bladder sits in the insulated main compartment lined with durable mylar. It’s attached to a hose with a bite valve that prevents leaks. An extra pocket is located on the front of the backpack to hold small accessories. The shape of the backpack covers only 10% of your back, making it light and aerodynamic. The straps are made from breathable mesh and have anti-chaffing pads for comfort. 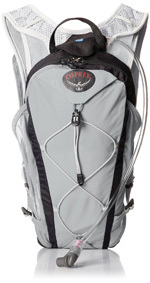 This option from Osprey is sleek and stylish, yet packs in a lot of useful features. It is made from 100% durable nylon and has a sizable main compartment with sleeves to fit pumps and other necessary tools. It’s lined with an embossed fabric to keep delicate items free from scratches. 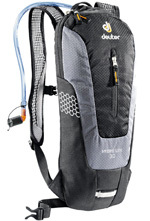 The included 2-liter hydration bladder is accessible via a dedicated sleeve for quick refills. The straps have adequate padding and a mesh fabric for breathability. There’s also a removable belt to secure the backpack on tough runs. For extra convenience, the backpack has a system to attach a helmet. Designed for comfort and performance, the EVOC FR Protector Lite has a lot of features to ensure that you are safe. A special technology is used on the back of the pack to protect the spine. It reduces the shock from impacts on the trail by up to 95%. The system itself is light and replaceable. The exterior is made from PU-coated ballistics nylon that is durable and water-resistant. There’s also reflective material throughout to ensure that you are seen even in low light. 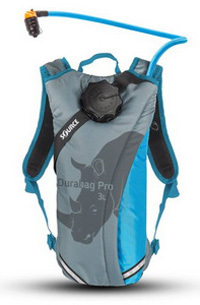 It holds a hydration bladder of up to 3 liters and contains numerous pockets for storage. From TETON comes a larger option that can store a variety of essentials. Numerous zippered compartments are located on the exterior of the backpack while mesh pockets are conveniently located on the sides and waist belt. The belt, chest, and shoulder straps are contoured to the body and are easily adjusted for a snug fit. The back has a cushion system that reduces the stress of impact and lessens bounce on the trail. It’s also ventilated to combat sweat and discomfort. The backpack holds a 3-liter bladder that is attached to a thick tube with extra protection from leaks. 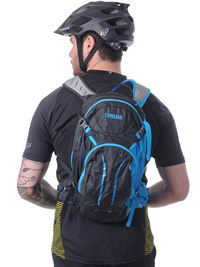 The Blowfish backpack from CamelBak is made for the modern mountain biker. It has plenty of storage space, including a pocket designated to keeping bike tools organized. There’s also a pocket lined with fleece to protect your smartphone. The main pocket is expandable via a zip panel. It increases storage capabilities up to 40%. The front and sides of the backpack have reflective materials for increased visibility and a handy blinker tab to signal where you are going. The mesh harness and multiple straps are adjustable to keep the backpack secure. It holds a 2-liter bladder. 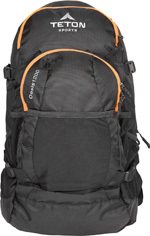 The Daylite backpack from Osprey is a versatile option for those who want to use it for other purposes. The main compartment can hold a hydration bladder while you’re on the trail or a tablet when you’re not. It has an interior sleeve for security and opens completely to load in items for storage. The additional front pocket has enough room to hold smaller items and includes a mesh organizer and key clip. The shoulder straps have a built in spacer made of breathable mesh that can be tucked away when not in use. It comes in numerous stylish colors for everyday wear. While a backpack is better than no backpack at all, there are a few features that could make using the backpack and hydration bladder much easier. When shopping for a backpack, it’s important to take your activity level and needs into account. This will make it easier to narrow down the options and find the perfect backpack. The amount of storage you need should be considered prior to choosing a bag. 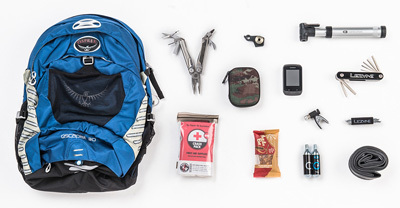 While shorter trips don’t necessarily call for a lot of baggage, a full day out on the trail will require more essentials. There needs to be space for a larger bladder and more gear. Space for a wallet and cell phone are a must-have. Not only that, but emergency supplies and bike gear should be included. A dedicated space for emergency gear can make a huge difference in the case of an accident. Bike gear organizers will also prove to be beneficial should you ever run into any issues. The way you bike and where you are going can make all the difference. A bigger bag is handy for long trips while a more compact option is suitable for a quick ride. That being said, the size of the backpack is directly connected to its form and shape. While it may not seem like it at first, the size of the backpack can have a huge effect on your overall performance. A larger back will be more cumbersome on the trail, even if it is not filled to the brim. To keep your performance at its best, backpacks should be as small and aerodynamic as possible. Many manufacturers cut down the size of the bag by sacrificing storage space. These bags generally hold larger hydration bladders but offer little in terms of additional storage. While this may be better for comfort and performance, it can prove to be a problem when you need gear you don’t have. Aerodynamic bags are smaller width wise, reducing the coverage on your back. This keeps the backpack out of the way as you make your way through the mountain trails. They may also have a tough exterior in a shape that reduces wind resistance and drag. Choosing a comfortable backpack is important, as it can reduce the chances of potential injuries. Backpacks with protection systems on the back and straps make it suitable for prolonged use. They’ll reduce stress on your spine and increase your overall endurance. The fit of the backpack also plays a role in comfort. Most options have adjustable shoulder straps, but that may not be enough. Backpacks with multiple straps and harnesses will keep it snug to the body and prevent bouncing. Belt and chest straps should be fully adjustable to increase safety and comfort. Additional features, such as spacers and contoured straps will further improve fit. Breathable fabrics will increase air circulation throughout the bag. On a mountain trail, you’re exposed to a lot of weather conditions. Warm and humid air will bring up your body temperature, causing you to sweat. Mesh fabrics will improve air circulation to keep you cool and prevent overheating. 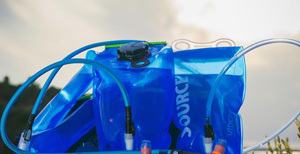 The bulk of the weight and used space will come from the hydration pack. It’s important to choose an appropriate size based on how you ride. Smaller bladders are great for quick rides or for riding in areas where you can get a quick refill while large capacity bladders holding up to 3-liters provide the most hydration when water is not easily accessible. Filling up the bladder is another thing to consider. Some backpacks require you to remove the bladder entirely to fill it. This can be a frustrating process. Choosing a backpack with easy access to the fill valve will eliminate this task. The build of the bladder and hose itself can make a huge difference as well. Cheaply-built bladders are notorious for causing leaks that can ruin your ride. A bladder with a tight seal to the hose will ensure that leaks don’t occur. Thick hoses will last for many rides. They are built to withstand a bit of wear and tear. Covered hoses are protected from the effects of the sun and any physical damage, prolonging its life. The way the hose is used can also make a difference. Sip tubes are one of the most convenient options, but they can easily drip when not in use. Bite valves require a bit of pressure to access water, but they seal themselves when no pressure is present. 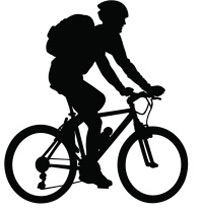 All in all, mountain biking backpacks with a hydration bladder are a great piece of gear to have. They keep you hydrated on your adventure while storing essentials out of the way. Instead of fumbling with bottles covered in dirt and grime, you can invest in a high-quality backpack and have a large supply of water on you at all times.